this sleek chain has a great deal of visual charm. The 14K yellow gold Figaro links form an attractive jewelry piece secured with a lobster claw clasp. This versatile chain works comfortably for both every day wear and formal settings. The hollow links are making a lightwiegt yet durable piece and will last a lifetime when properly cared for. To keep this high polished chain shining and scratch-free, avoid contact with chlorine and other harsh chemicals. Do not wear jewelry during rough work and be sure to store it in a fabric-lined jewelry box or pouch. To clean gold jewelry, use warm water, a mild soap, and a soft cloth, if needed. GORGEOUS FIGARO CHAIN: Figaro chains are a favorite among jewelry lovers of all ages!, Wear it for a bracelet or ankle bracelet. This Figaro Chain Bracelet for men and women are durable, stylish and hypoallergenic, it will make you look attractive. AVAILABLE IN MULTIPLE SIZES: This 14k gold figaro chain is available in 4 different sizes, letting you choose the ones that best fit. 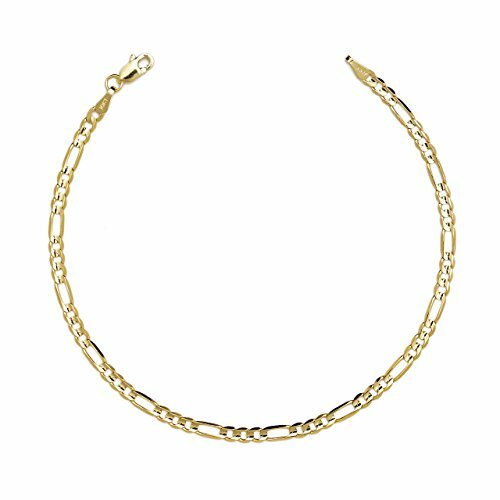 LOBSTER CLAW CLASP: This beautiful gold figaro chain is outfitted with a lobster claw clasp, making it easy to fasten around your hand or ankle and remove. GIFT IDEA: This figaro bracelet and anklet makes a great gift idea for moms, dads, girlfriends, wives, etc. for all occasions such as birthday, valentine's day, holiday, Christmas, anniversary, or engagement, Shipped in a beautiful gift box.